GAMEVIL had a huge hit with Cartoon Wars, which is why we were keen to try their newest contribution to the gaming world: Cartoon Wars: Gunner+. According to what we've heard, Gunner+ comes in the same style as Cartoon Wars, but the game itself is an entirely different genre. We jumped right in and tested the app out for you all, and you can read about our experience in the review below. Captain J was the king's footboy, but quickly gained power—too much power for the king's liking, who in turned exiled the Captain and sent his entire army after him. Captain J is shrewd and brave, and has a few tricks up his chain mail sleeve. A virtual controller is located at the bottom left. The one on the bottom right is used to fire weapons. Press down to power blast. By pulling you can also control the direction in which you're shooting. The game field is both long and vertically deep, and opponents will charge at you left, right and center. Keep checking the bar for your energy stats. Upgrades (life force and weapons) can be purchased or achieved by playing steadily. You will have to upgrade from your simple bow and arrow one way or another, as the enemy troupes grow stronger and stronger over time, ranging from lions to club-bashing robots. There are 30 enemy types in total, which makes for a good amount of variety. Plus, the devs have announced more upgrades for the future, and we're waiting with baited breath! There are many, many weapons and each type of weapon comes with ten upgrade options. Some of your weapons will overheat when you use them for too long, forcing you to use something else while they cool down again. Graphics are great: colourful and with a good sense of humour. 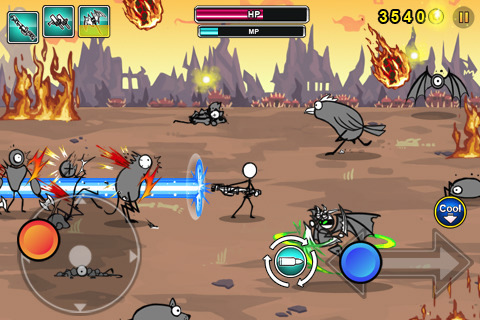 Cartoon Wars: Gunner+ is a worthy Cartoon Wars offspring. Aside from all the different weapons, there are also three difficulty levels and an online position table. As mentioned, the graphics and design are fun, and on the whole this is the type of game that guarantees hours of entertainment over a longer period of time. 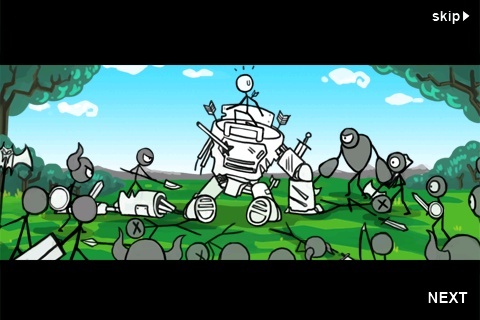 The Cartoon Wars: Gunner+ controls are ace and compliment the gameplay nicely. The menus are set up intelligently and are easy to navigate. 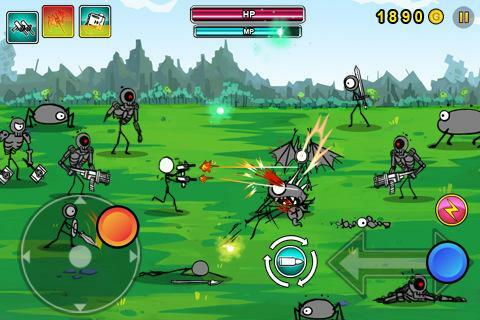 Cartoon Wars: Gunner+ run smoothly even when the battle field was flooded with opponents. 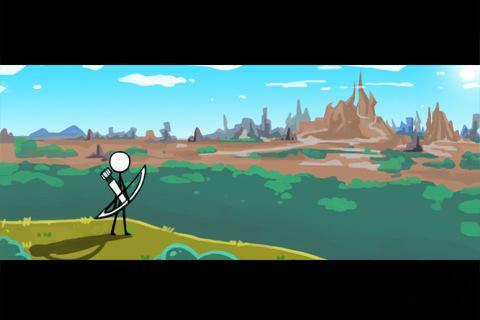 Cartoon Wars: Gunner+ is free and can be downloaded from Google Play. A few head starts can be purchased with real money, but you can also just wait till you earn them by going through the appropriate channels within the game. A great game that's free to boot = five star rating in our book. Thanks for commenting, and hope you'll enjoy the game, our reviews and your time here at AndroidPIT!